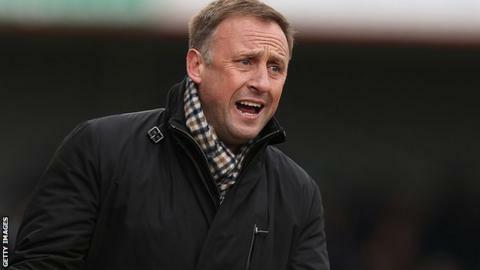 Cheltenham boss Mark Yates says he "cannot wait" for the season to end after their 2-1 loss against Southend. The Robins, last year's play-off semi-finalists, took the lead just before half-time but two goals in three minutes saw the visitors seal victory. Yates' side have now dropped 31 points from winning positions this term. Cheltenham Town have dropped 31 points from winning positions this season. They have ended up with five losses and eight draws after leading in games. "I really just want to get through the next few games, get some points and get people to start playing for a bit of pride," he told BBC Gloucestershire. "I can't wait for this season to end. "It was pathetic from the players and I'm really angry with them for that. "I'll take the blame, they're my team and I get that, but the players have got to stand up and be counted." Cheltenham have reached the League Two play-offs for the last two seasons, but currently sit nine points from seventh spot in 13th and are eight points off the drop zone. They have five games remaining in the regular season, against Exeter, Fleetwood, Mansfield, Rochdale and Dagenham, and Yates is already considering making squad changes in preparation for next term. "Maybe it's time to give one or two kids a game," added the 44-year-old. "We just haven't got enough leaders out there. "This season has been disappointing, we know that. We'll get the chance to put things right in the summer. "We'll bring one or two different players in. There will be one or two players out there today who won't be around."